K is the letter this week for the ABC's of homeschooling meme. K is for Keepsakes! One of my other hobbies besides homeschooling, blogging and geocaching is scrapbooking. However I haven't had much time to devote to it lately and feel more like a scrapbook supply hoarder, lol. I love to take photos and collect keepsakes for our albums for every event or trip. One of the pages out of our Dollywood album. My keepsake collecting has even rubbed off on my kids. Every time we take a fieldtrip or have something exciting take place like a milestone, holiday or birthday they collect keepsakes for our albums. On fieldtrips they also insist I take pictures of them posing with everything we encounter. So I thought....well maybe I can incorporate scrapbooking into homeschooling somehow. They love stickers, cutting, gluing, and coloring which is basically all scrabooking really is. And scrapbooking can be very educational. Kids can learn their colors, practice handwriting, composition, fine motor skills and more. Here are some ideas I came up on ways to incorporate scrapbooking and keepsakes into homeschooling. Create a yearbook! Just because we are homeschooling doesn't mean we cannot have a yearbook too or a class photo. Take pictures of the kids on fieldtrips, playing and homeschooling. Journal about accomplishments, goals, favorite subjects, interesting things that were learned. And don't forget to include handwriting samples, workbook pages (could be used as background) artwork, and projects (or pictures of projects if they are large). Your yearbook can also serve as a annual progress report for family or maybe even the state? And of course be a cherished keepsake for your child to preserve your their memories and school days. Have more fun with unit studies and lapbooks! Unit studies already involve a lot of cutting, gluing and coloring. But how about expanding on that and including pictures, keepsakes, etc of items relevant to the unit study. For example if the unit study is on trees have your child take pictures of trees, or include a piece of bark from a tree. Create story books! Have your child make up their own story and use family pictures, keepsakes etc. Create cards! Rather than purchasing store bought cards have your kids use their scrapbook supplies to make them. They can create their own Thank you cards when they receive gifts and include a picture of themselves with the gift. Create a pet scrapbook! If you have a pet your child could create a scrapbook when they learn about that animal. Create handmade gifts! Around the holiday's have the kids create handmade gifts using their scrapbook supplies. 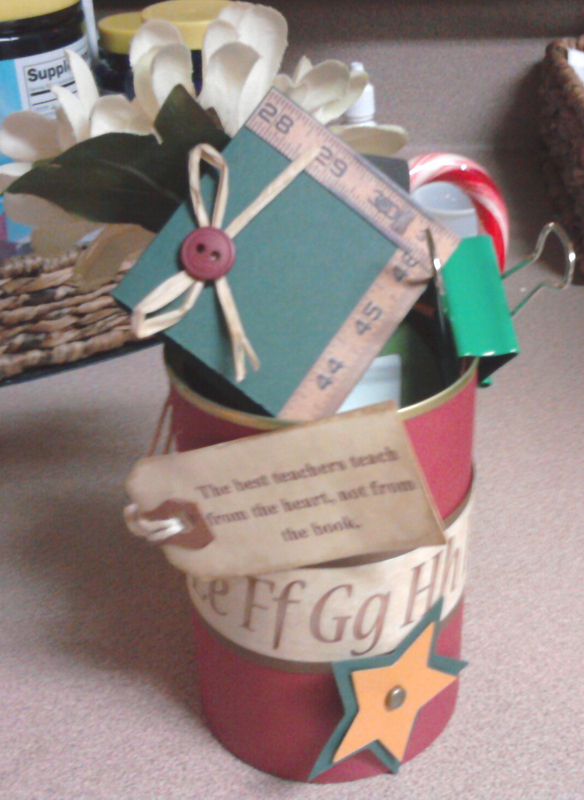 Kids can create handmade story books, pencil/pen holders (like the one below) and candy bar wrappers. Pencil/Pen holder made with a tin can and scrapbook supplies. So what are you waiting for? Go gather your supplies and get the kids started. I must confess I don't scrapbook. But we do daily journal writing as part of our homeschool curriculum. Our journal is a place full of memories and includes illustrations, photos, tickets, programs, museum maps, etc. Our journals are our version of a scrapbook.